This is a fantastic experience to tick off your bucket list! Experience the thrill of an exhilarating aerobatics flight, including loop-de-loops and 360° rolls. 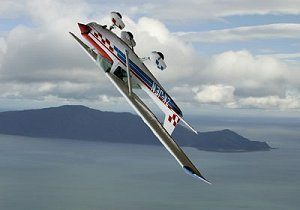 Upon arriving at Kapiti Aero Club, your flight instructor will introduce themselves to you and sit you down for a detailed ground briefing on the basic controls of the aircraft before explaining the various aerobatic manoeuvres they will be performing with you. Before starting up and departing you will have a chance for friends and family to walk out to the aircraft with you to take some photos of the aircraft and of you in the pilots seat. After fitting your seat belt and a briefing on the safety features of your flight, the instructor will close the doors and start the engine. After start-up, there are some “cockpit” checks to be made to ensure that the aircraft is ready for flight. With a careful lookout for other aircraft on the ground and a radio call, under the guidance of your instructor you will taxi the aeroplane out to the threshold of the active runway ready for takeoff. Once airborne you will be amazed by the wide-open view you will get from the pilot’s seat. Your instructor will show you how the controls work in the air and under their guidance; you will fly the aeroplane yourself. You will have control! Following this your instructor will demonstrate to you a few aerobatic manoeuvres including loops and rolls. You will feel the freedom of flight and the exhilaration of aerobatics! Max weight limit 115kg per person.